Looking for a captive bred baby chameleon for sale? We’ve got the nicest baby, juvenile, or adult chameleons for sale online! 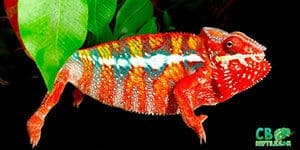 We have a fantastic selection of captive bred Panther Chameleons as well as veiled chameleons for sale online. 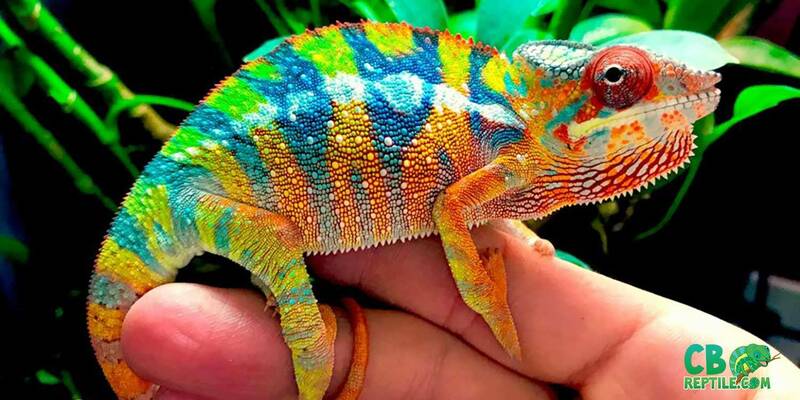 As a Panther chameleon breeder as well as veiled chameleon breeders we specialize in vivid color morphs of both of these wonderful species of pet chameleon for sale. 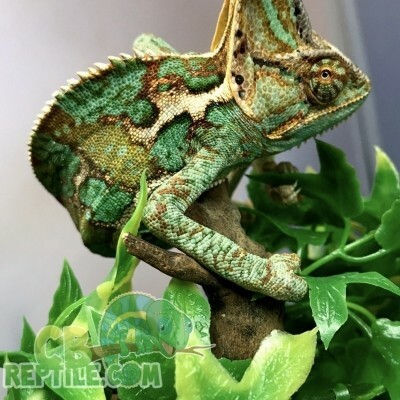 CBReptile.com also offers some extremely rare and unique designer cross panther chameleons for sale including crosses of many locales. 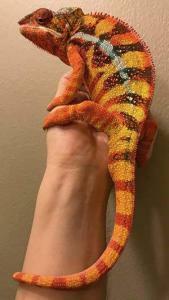 If you are looking for a baby panther chameleon, explore our wide selection of panther chameleons for sale online including: baby ambilobe panther chameleon, baby ambanja panther chameleon, baby nosy be panther chameleons as well as rarer or locales like the baby nosy faly panther chameleon, nosy mitsio panther chameleon or the baby sambava panther chameleon. We also have tamatave and other locales of baby panther chameleons. 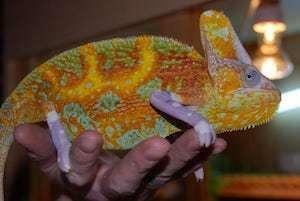 looking for a panther chameleon for sale online? Unlike other chameleon breeders, CB Reptile has a real biologist on site. 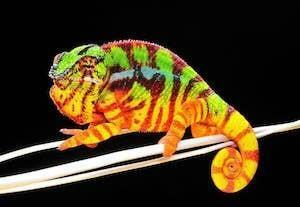 Our biologist specializes in all locales of panther chameleon. Besides different locales, we also offer 3 age/size groupings. 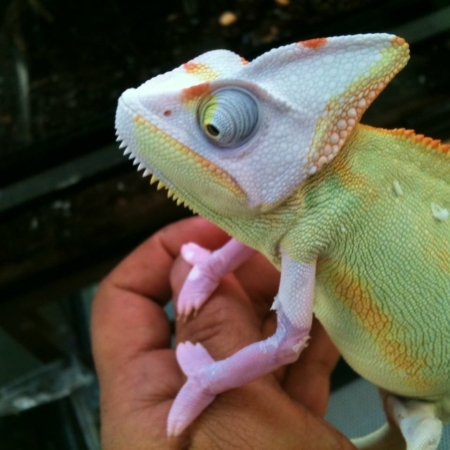 These include baby panther chameleons, juvenile, and adult panther chameleons for sale. We offer both male panther chameleons as well as female panther chameleon for sale in nearly all panther chameleon morphs also known as panther chameleon locales. 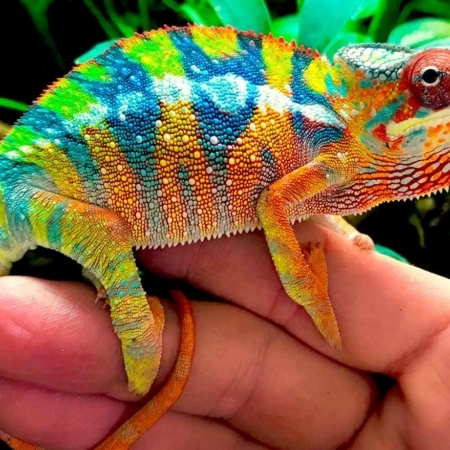 We specialize in chameleons for sale online, including panther chameleon, baby panther chameleon, ambilobe panther chameleon, baby ambilobe panther chameleon, as well as other locales. 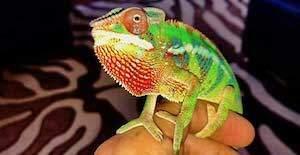 Offering a variety of captive bred reptiles for sale online, we also are breeders baby nosy be panther chameleons for sale online. Also, from time to time, we offer the adult Nosy Be panther chameleon. 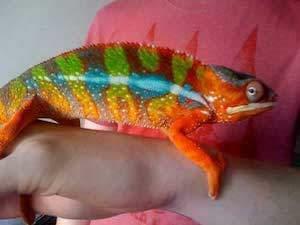 We offer Nosy Faly panther chameleon for sale, baby nosy faly chameleons for sale online. Feeling blue? 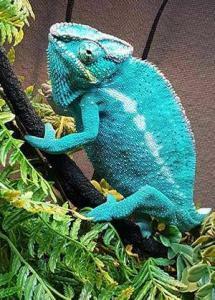 If you are searching for a blue chameleon, also consider our Blue Ambanja panther chameleon. Did you know that our baby blue ambanja panther chameleon online are super blue? The vivid colors are absolutely stunning. 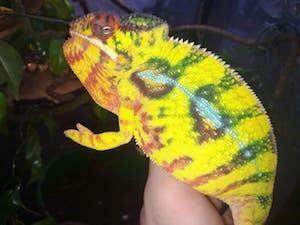 We offer Ambanja panther chameleons for sale online as well as Sambava panther chameleon. 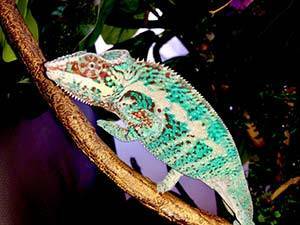 Why choose captive bred panther chameleons? Chameleons have a reputation for being difficult to care for. 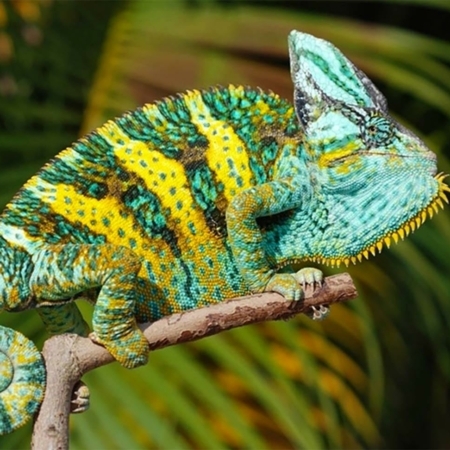 Chameleons’ reputation was largely “earned” due to the poor condition of many wild imports. Besides this, all too often, insufficient care practices. 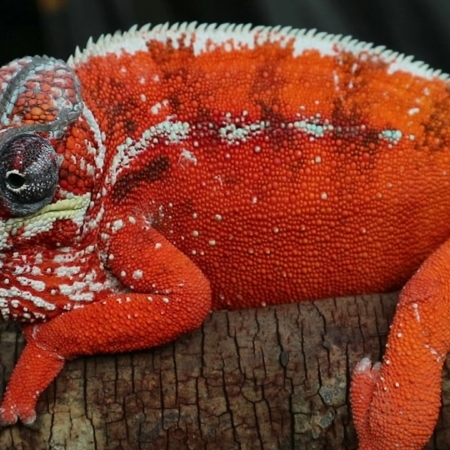 A wild caught (rather than captive bred) chameleon for sale online often has a variety of health issues, including internal parasites, wounds, infections, dehydration, and a depressed immune system. A wild-caught chameleon’s age cannot be determined with certainty, and because of this, even an otherwise healthy individual may have a limited lifespan simply due to age. 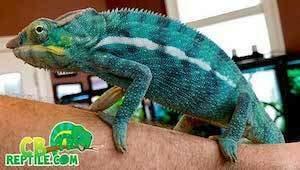 Panther Chameleon color morphs, better known as panther chameleon locales addresses the many varieties of panther chameleon for sale. Color is a prominent feature of the panther, and there is an abundance of beautiful and unique colors being produced. 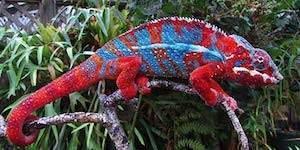 Some will be surprised to learn that despite viral videos and TV paint commercials, the panther chameleon does not change color to instantly match any background it is placed against. Panthers do exhibit color change, though, for a variety of reasons, including a method of communication, to better absorb or reflect radiant heat, and to blend in with natural habitat. Baby Panther chameleons for sale are starting to become more and more popular. We actually recommend purchasing a juvenile or young adult panther chameleon, as they are much easier to care for, but if you are interested in a baby panther chameleon hatchling for sale we do have them available. Challenges with keeping baby panther chameleon healthy and growing correctly are associated with locating smaller insects, like 1/8th crickets, or flightless fruit flies. Baby panther chameleons also need to be showered up to 15 times a day for 1-3 minute intervals, making hydration a larger concern when carrying for a panther chameleon baby or hatchling, regardless of the locale. 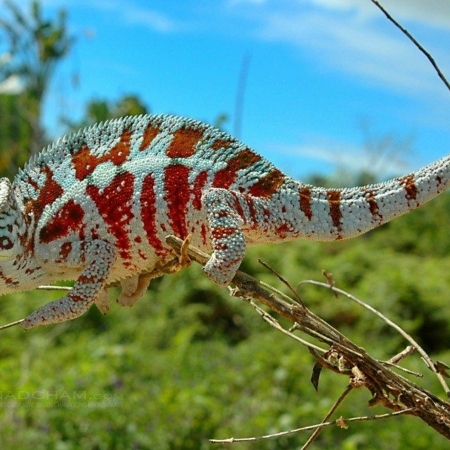 Some locales of panthers do grow faster and slower than others, with the Ambilobe Panther Chameleon growing the largest, and the fastest. 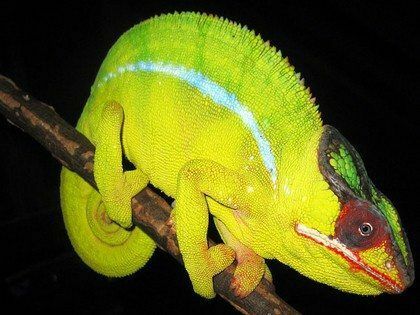 Panther chameleons are sexually dimorphic; males are larger (15 to 20 inches total length) with a wider range of colors than females. Depending on mood or visual stimulation, males may display colors that indicate a relaxed or excited state. When a male is excited and “fired-up,” he is likely sending a visual message to a rival male that he is willing to defend his turf, and to a female that he is ready for courtship. 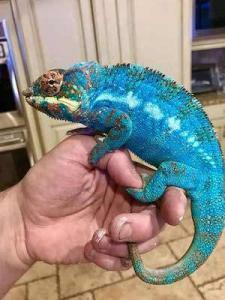 Full-sized panther chameleon females for sale are 8 to 10 inches. 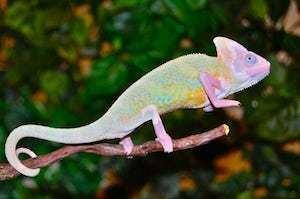 Mature female panther chameleons display softer color hues, including peach, rose or violet, when receptive to breeding. A female that is gravid or unreceptive to the amorous intentions of a male will flash highly contrasting colors, such as black in combination with red, orange or pink. All screen is the way to go, or at least mostly all screen (some cages have glass front doors for better viewing) for Panther Chams is all-screen cages or cages with at least two screened sides (front/top, side/top) with otherwise solid walls. The advantages are increased water evaporation, lighter weight and the ability to achieve a warm basking spot without overheating the entire environment. If you heat or cool your home the air can become quite dry, and chameleon cages featuring solid side and back walls can help maintain humidity within the cage while preventing misted water from getting on your walls and furniture. 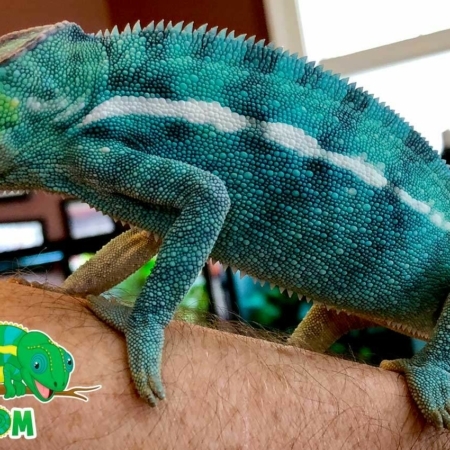 Here at CB Reptile, our main chameleon rooms maintain an ambient daytime temperature of 75-77 degrees Fahrenheit. Also, we provide them with a basking spot of 89 to 95 degrees per panther chameleon enclosure. Nighttime chameleon temperatures are 72 to 76 degrees. Mounting the basking lamp, or basking heat element on top of or suspended over one corner of the cage. Position the branch or vine directly below it, at a distance to achieve the proper basking temperature. 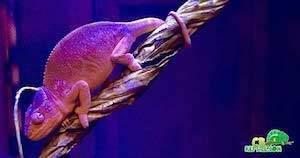 As baby panther chams grow, the same perch that was once a safe distance from the heat source may become too close, so adjust as required to prevent burns from the heat lamp. Monitor all of your temperatures with a thermometer, and watch for seasonal fluctuations. If your home gets cooler than 65 degrees at night, use a ceramic heat emitter to raise the nighttime temperature keeping it 72 degrees at the lowest point of the day or night. 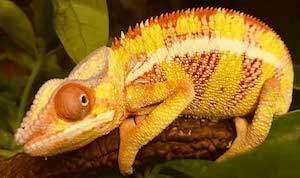 Considering a new pet chameleon? 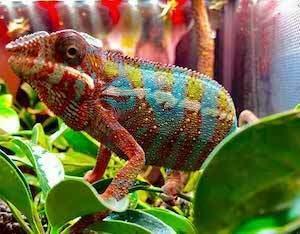 At CB Reptile, we also work with the more common and less colorful veiled chameleon. 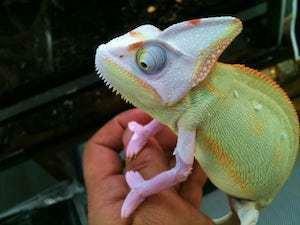 Various species of veiled chameleons are available including the piebald veiled chameleon. 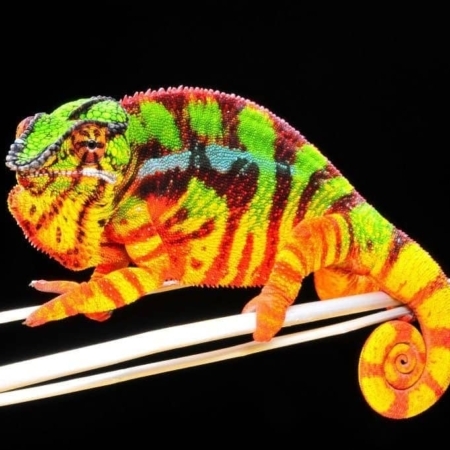 If you are searching for the perfect new pet chameleon from the best chameleon breeder, you have come to the right place! All of our pet chameleons are 100% captive bred! 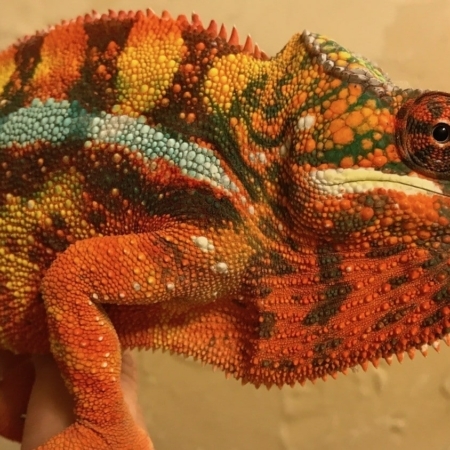 CB Reptile offers all types of pet chameleon for sale including the common veiled chameleon for sale as well as more rare species like Panther Chameleons. 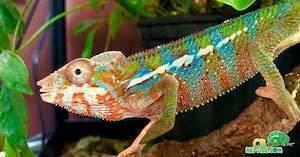 If you are searching for the right chameleon breeder to find the most beautiful pet panther chameleon, you have come to the right place. 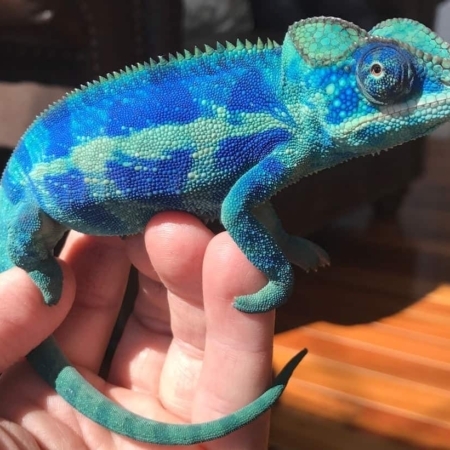 CB Reptile’s panther chameleons for sale include the option of buying a baby panther chameleon, a juvenile panther chameleon or adult panther chameleon for sale. 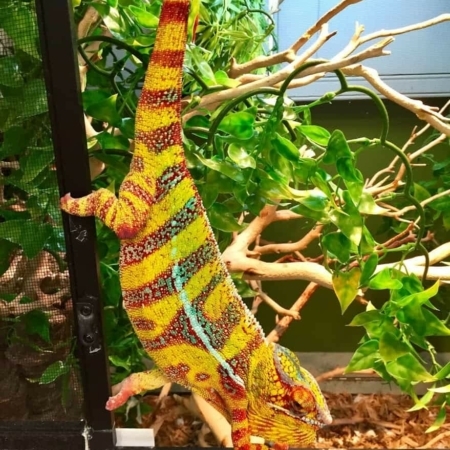 We also have male panther chameleons for sale as well as female panther chameleon for sale from all panther chameleon locales including the most popular Ambilobe panther chameleon, Ambanja panther chameleon, Nosy Be panther chameleon and Nosy Faly Panther Chameleon. Our baby chameleons for sale are all 100% captive bred and come with our full health guarantee. Lastly, if you’re considering other reptiles for sale, be sure to check out our sister website. Tortoise town also offers panther chameleons for sale.